The chip giant's chief exec talks to TheStreet about Intel's resurgence, its autonomous vehicle strategy and the recent run-up in tech stocks. Intel Corp.'s (INTC - Get Report) past has always depended on the personal computer. There was the ubiqitous "Intel Inside" campaign of the 1990s, which put the distinctive logo on seemingly every PC (from Dells to MacBooks) and made Intel into a household name. The company quickly ascended to become the world's top supplier of PC processors, earning it the name "Chipzilla" for its monster share of the market. But in just a short period of time, the tech sector has undergone a seismic shift, as the personal computer began to cede its dominance to handheld devices such as the smartphone and tablets. Intel failed to jump on the move to mobile and watched as the PC business began to crumble. For Intel, which saw the bulk of its revenue come from PC chips, it seemed to be a doomsday signal. Enter Intel CEO Brian Krzanich. Since taking on the role in 2013, Krzanich has engineered a major turnaround of the chipmaker's business. Intel's PC unit has bucked industry-wide declines and continues to grow, even though it's now a smaller share of the company's overall business. The company has managed to enter and dominate new markets such as data center server chips, and has expressed growing interest in capitalizing on the rise of artificial intelligence. And Krzanich has charted new frontiers for Intel, such as building semiconductor chips to power autonomous vehicles, cloud computing and the future of 5G wireless networks. Since joining Intel as an engineer 35 years ago, the 57-year-old Krzanich has watched Intel rise, fall on hard times and, within the span of his tenure, come back stronger than ever. 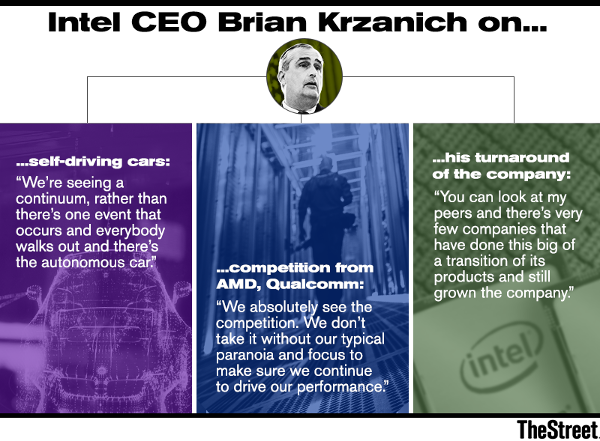 TheStreet spoke with Krzanich about what's powering Intel's business now, the autonomous vehicle revolution and how it's staving off the likes of Qualcomm and AMD, among other topics. Below is a condensed version of the conversation, which has been edited for length and clarity. TheStreet: Intel has invested a lot in the future of self-driving vehicles, setting forth ambitious targets like bringing an autonomous vehicle platform into production by 2021. How do you gauge the pace of the self-driving market right now? And what is Intel's role in the future of it? Krzanich: We started our efforts with autonomous driving roughly three years ago. What you've seen over the three years, as we really learned what is required, is this constant acceleration to where it became [something that would definitely happen] by mid-decade, or 2024 to 2025. Then it became early in the decade -- 2021. There's really a race toward how soon can you do this and what is the continuum of autonomy. So, how do you move from today's vehicles that let you know when to do lane change and let you know adaptive cruise control, to ones that can pretty much drive the freeway from on ramp to off ramp? Everyone's believing it can be done faster and faster and we're seeing a continuum rather than 'there's one event that occurs and everybody walks out and there's the autonomous car.' So I think that's going to help with everything from regulation to people's acceptance and just how we're able to develop the technology. TheStreet: You're placing a lot of focus on this technology, but it's not necessarily going to materialize immediately. What do you say to some folks that raise concerns about this? Krzanich: People do ask 'How are you getting your return?' I tell them there's a couple of ways. When we look at a market like this, we not only look at the computer that's in the car, we also look at the data center that's having to be built out. We not only look at it as what's the future of autonomous cars, we really look at them as devices that are generating data [that's sent] to data centers. That's actually occurring right now and growing rapidly as we go through that continuum of autonomous driving. That's part of why we want to be a part of this business. So our returns start almost immediately. TheStreet: Do you envision making more deals in the space like the acquisition of Mobileye? Krzanich: No, we don't think we need to do a lot more acquisition. If you take a look at it, there's three areas of 'compute' in this mobile driving business. There's the data center, we already have a great position there. There's the computing inside the car that reads the world and takes the camera, the Lidar and the sonar sensors that build an image of the world. Mobileye does that. And then there's the 'OK, now once I've got that image, I've gotta make decisions and basically drive the car.' Intel already has a strong position there. So we think we've got all three areas of the computer built out now with this acquisition. TheStreet: Let's talk about the data center business. Intel just released a new processor chip in July, but players like AMD (AMD - Get Report) and Qualcomm (QCOM - Get Report) are threatening to go after your controlling share of the market. How is Intel differentiating itself and remaining aggressive? Krzanich: We absolutely see the competition. It's continuing. ARM Holdings has been a competitor, Qualcomm has always been a competitor. You can argue there's some better ones now. I think it will always get better and more intense. We don't take that competition without our typical paranoia and focus to make sure we continue to drive our performance. Rather than focus on just purely the CPU performance, which we absolutely have a focus on and will be and remain the leader, we're actually thinking of the whole data center rack now. We're really building out a rack so that if someone wants to come compete with us, you really have to compete in all those segments. TheStreet: Several of your rivals are capitalizing on the recent enthusiasm around Bitcoin. Does this make you want to become a bigger player? I know you've made an entry somewhat through blockchain technology. Krzanich: I think for us it's going to be good business, but I don't think it's going to be one we necessarily have to focus on. We'll play there, but we're not necessarily going to build a lot of specific silicon for that space. TheStreet: What do you think Wall Street wants to see from Intel at this point? What do you hear from investors right now? Krzanich: The story I remind them is that four-and-a-half years ago when I took over, we were 80% a single product company, namely the PC. We had a small burgeoning data center business that we had good share in, but if you look at that, it was mostly enterprise. Both of those areas declined in the first four years here. And then we tried some other areas -- at the time tablets were growing 30%, now they're declining. We went from an 80% singular product company to now roughly 50% of the company is the PC, and the other 50% are the new growth businesses -- cloud, storage, networking, memory, all of these other connectivity modems. You can look at my peers and there's very few companies that have done this big of a transition of its products and grown the company. What Wall Street's looking for, part of the biggest feedback I get is OK, we see it, we see the transition you've done. We need a couple of things from you. We need to see you sustain that growth and show us that you can keep doing it. We did it in 2016 with nice growth, we did it in 2017 with nice growth so far. And they say we need to trim back our spending and make sure we're really focusing. TheStreet: One of the big topics of the summer has been the huge run up in the tech sector, especially the FANG stocks. At one point in 2000, Intel was among the most-valued companies in the world. How do you judge the recent rally in tech stocks, as well as fears that it may lead to a correction similar to the tech bubble of the late 90s? Krzanich: I don't want to consider myself a prognosticator of stocks. I'll leave that to [Jim Cramer]. But I look at Intel and I think we are not overvalued, in fact, I believe we're undervalued. I believe at the end of the day, you have to have earnings that validate the value of your stock. And you have to have that earnings growth in order to get the higher price-to-earnings ratio. We have the strong earnings that warrants our stock price and I believe we have the growth that deserves a higher P/E ratio. When I look out at the market, where I worry about valuation is when I don't see those earnings substantiated behind a company's valuation. You have to make revenue but more importantly, you have to make profit off of that revenue. And that's where I think, when those things get out of alignment, that's when you get into trouble.